On this day [December 4th] we commemorate our Venerable Father John the Presbyter of Damascus. Arranged together with heavenly music above. He lived during the reigns of Leo the Isaurian (717-741) and his son Constantine the Copronymos (741–775). Hailing from Damascus, he was from a brilliant family, that were also adorned with the Orthodox faith. Because he had a father who loved virtue and loved that which is good, he exercised with his foster brother the divine Kosmas in all wisdom, even those who were not Greek, as well as those who were Greek and of our own, and his teacher was also called Kosmas, a most revered and wise man. His surname was Asikrites, and he was purchased by the father of the divine John together with other slaves. Wherefore, having come upon such a wise teacher, both brothers reached the peak of wisdom. 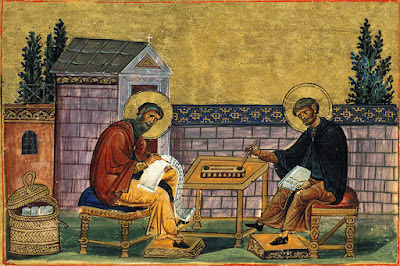 Then both became Monks, occupying themselves only with God and the Divine. John was separately given over by the director of the Monastery of Saint Savvas, to a great and wise elder in divine matters, and was taught by him blessed obedience. He was ordered by him to never chant, even the slightest psalm, from the art of music he knew. For this reason John steadfastly kept this order of the elder for many years. It is said that the Most Holy Theotokos appeared in the elder's dreams, and said to him to urge his submissive John to write hymns to the glory of Christ, Who was born of her without seed, and for the boast and joy of those Christians, who have need of glorifying the Theotokos. John himself also had need of glorifying the Theotokos, because he received much help from her. The ruler unjustly had his hands cut off, and the Theotokos restored him healthy and whole by her great power. 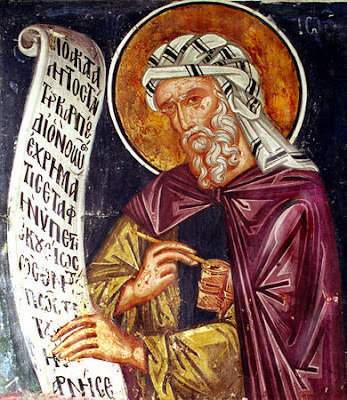 Wherefore the divine John received permission from his elder, and he wrote honey-distilled hymns and praises, for the purpose of directing his asmatic melodies, and his other prose, to the Mother of light and Lady Theotokos. In this way this divine luminary of the Church composed many writings, through which is found the solution to every written question, and of all discussions and interpretations. And with the power of his words, and his proofs from divine Scripture, he attacked the impious heresy of the Iconoclasts. Wherefore until the end he did not completely descend from the ascetic life, but his holy life ended in deep old age, having lived 104 years. Thou wast a holy instrument and a tuneful harp of godliness. Thy teachings shone forth to the ends of the world, O venerable John, entreat Christ our God to grant us His great mercy. Let us praise the illustrious hymnographer John, teacher of the Church and champion against her enemies. For armed with the weapon of the Lord's Cross, he hath banished the errors of heresy. He fervently intercedes with God Who grantest forgiveness to all.